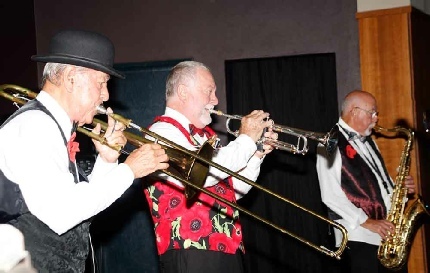 Our friendly and relaxed club has a strong history of supporting jazz in Townsville and has made a great contribution to the Townsville Arts and Music Community over many years. We encourage new guests to become members and to actively participate in the club’s functions. We feature a range of very talented local bands playing great jazz music in a relaxed yet vibrant environment. The regular jazz night always has a sit-in bracket and dancers are most welcome. Meals are available most nights. No need to book. Where: Townsville PCYC, Wellington Street, Aitkenvale. PCYC unavailable till further notice. We are having a change of venue for our Anzac Tribute Night so we can have dancing, dining, drinking and a generally awesome night with Les and the boys (PMJB). The evening will be held in the OES Hall on Ingham Road, West End. There is no bar available at this venue so the best thing to do for drinks is BYO. Please come along and support your Club. The Anzac Tribute evening is always lots of fun and we can assure you this year will be no different.